Lynch went from Denver's FO to GM of the Niners. He asked permission to interview some of Denver's personnel and hired a FO guy and an assistant coach away from the Broncos. Maybe Elway reminded him of that? All's well that ends well. I think it was Shanahan that was blocking the interview and then I think it was Lynch that talked with Shanahan convincing him of what’s a more ethical move in this business and what isn’t. The Broncos have helped the 49ers to great lengths in the past and vice versa and I think John Lynch wanted to keep things that way. I'm just feeling excited about my Broncos for the first time in a few years if this hiring happens. Things feel like it's happening up. Now we just need a QB and we're in the money. I'm with you! The past few years have been pretty hard to live with. If all the positive reports on the new coaches are correct, then the Broncos might be fun to watch again---at the very least, hopefully enough variety in the play-calling (on both sides of the ball) that us arm chair QB's won't be able to call all the plays before they are run. 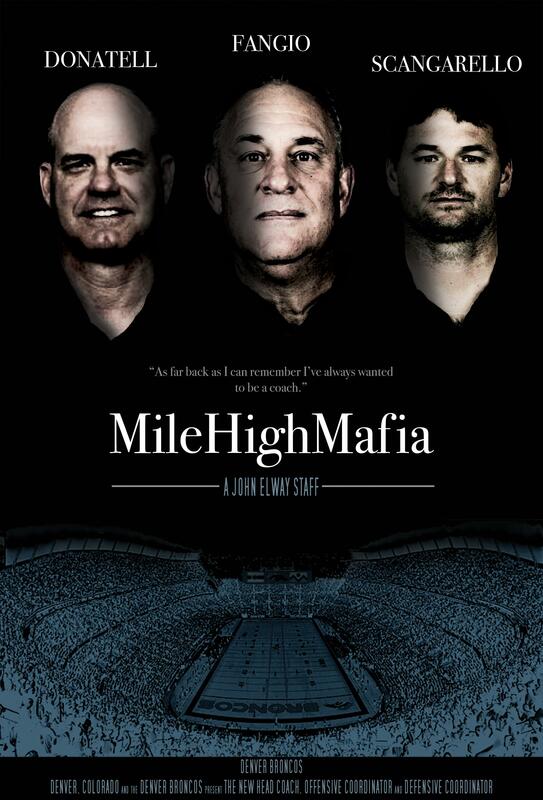 "Mile High Mafia" has a nice ring to it. If I lived in the US, that would be straight on a shirt, and I would be selling it as of tomorrow morning, someone get onto that. Rich Scangarello’s football philosophy will guide the Broncos’ offense in a new direction next season. Where will it lead? Scangarello, hired away from Kyle Shanahan’s 49ers staff, was introduced as Denver’s next offensive coordinator Thursday at UCHealth Training Center. Scangarello coached quarterbacks the past two seasons in San Francisco and will be a first-time NFL play caller in 2019. Here is a sampling of responses at his news conference. CK requires a lot of 'adaptation'. I hope Rich can do it or it will be another long season of groaning about QB ineptitude. I really think he's just being 'politically correct' (lying) about how and what he feels about Keenum. He had Mullen’s watch and study Case. He must see something in Case. After the interview today if he or Ed shine they will be a HC next year. If you are a coach in the NFL, and bad-mouth the players who you have under contract, then you won't be a coach long. We will find out in Free Agency and the Draft what conclusions the Broncos coaching staff have come up with conccerning the QB situation and Keenum, in particular. It's way too early, now. But yeah, I saw Scangarello speaking in terms of getting Keenum back to where he was in Minnesota. We'll know more at the end of April. I don't by any means think Case is a better than average QB, but he can play at an average level with an OC that properly uses him. We didn't properly utilize him last year so we got far below average play out of him. We still need to replace him, but if we're stuck with him starting for one more year, he can play at a higher level. I think if we run a Kyle Shannahan style of offense, Case will be right at home in that system. Yeah that was my point in saying he was just being "politically correct' cause what coach, especially a new coach, in their right mind is going to say less than positive things about a player...especially one that they may have to coach.